A relay CPU is a CPU built mostly or entirely out of relays. While at one time relays were the best available component for building a computer, nowadays one of the few advantages of a relay CPU over other CPU implementations is that you can see it working (very educational) -- building a CPU on a FPGA or other integrated chip makes it use less power, run faster, cost less, etc. than a relay CPU. Harry Porter built his "Relay Computer" out of 415 Relays, all identical 4PDT. Jon Stanley built "Relay Computer Two", a relay computer built from 281 relays. Is it possible to build a relay CPU from significantly fewer relays? In particular, is it possible to build a relay CPU from 256 relays or less? From 100 relays or less? What's the minimum number of relays in a relay-only CPU? What's the minimum number of relays in a diode-relay CPU? What is a good simulator for a relay computer? Bouncing is not a problem inside a relay CPU, but it can be a problem when you try to interface a relay CPU to a semiconductor RAM. What is a good method for debouncing? One of the commenters said "... there are pneumatic equivalents to electrical devices. Air - is there anything it can’t do?" I wonder how difficult it would be to build a CPU that, instead of being built of ICs or discrete transistors or relays, was built from pneumatically-powered devices. "How Computers Work" by Roger Young uses a relay computer in many examples. testability: single-step, breakpoints on program address, breakpoints on data address, breakpoints on data write address ... what other testability things are useful? Many programmers appreciate lots of general-purpose registers, rather than needing to remember a bunch of quirks associated with each register. Since memory is slow, keeping the "working set" of data in registers helps reduce the pressure on the memory interface (von Neumann bottleneck). --> directly easier to build because you don't have to build and test those registers. --> indirectly easier to build because there is less stuff (microcode, etc) needing to select *which* register. instructions that only work with *some* registers (quirky) --> less stuff needed to select *which* register. --> indirectly easier to build because fewer addressing modes to build and test. more registers makes the "carry bit" or other status bits less necessary. (a) It would be nice to use the fewest number of relays, because each relay will need to be hand-wired, and each "on" coil dissipates power. (b) It would be nice to do a bunch of work on each clock cycle, so we can get the same amount of work done in fewer clock cycles, reducing wear-and-tear on the relays ... and if the relays are optimally driven (approximate with "snubber" in series with coil, where the snubber is a parallel RC), it takes less power to "hold" the relay than to switch states. I suspect that balancing these 2 requirements is very similar to optimizing similar requirements for minimizing power in purely solid-state logic. 2008-05-22: DAV: thinking about building a cpu out of relays. standard 4 phase clock should work. But can relays support the setup and hold time requirements for 2 phase clock? Say we have a series of transparent latches. (They will have some combinational logic between them -- I'll ignore the combinational logic while trying to answer this question). Each "layer" of transparent latches is transparent on the "opposite" phase. On the falling edge of the clock: low-transparent latches become transparent, letting their inputs flow through to their outputs. (They may switch states). hi-transparent latches go into "hold" state, maintaining that bit until the rising edge of the clock. (They don't switch states). So ... for 2 phase clock to work, the low-transparent latches need to hold their "hold" bit long enough for the hi-transparent latches to grab it. one teensy glitch: during transitions, with a break-before-make relay, there is a short time when the output is "disconnected" -- typically representing "0". Is that going to cause a problem? No. This is a CLK-Hi-transparent latch. I suspect relays will have a pretty high latency -- after the CLK (driving the coil) changes state, it will be a while before the contact is broken. C relay coil changes state. Sometime later, the D contact breaks contact, and Q become the "not connected" state. Sometime after that, the Q contact makes contact, and Q becomes the held state. Hopefully the time between the break and the make is short enough that the short glitch at the Q relay coil isn't enough for it to change state. After the D contact breaks contact, clearly the D contact is in the "don't care" state. hold-to-transparent transition: C relay coil changes state. Sometime later, the Q contact breaks contact, and Q becomes the "not connected" state. Sometime after that, the D contact makes contact, and Q becomes the transparent state. Hopefully the time between the break and make is short enough that the short glitch at the Q output isn't enough to affect stuff downstream. master-slave bit: first latch transparent-to-hold, 2nd latch hold-to-transparent transition: ... doesn't seem to be a problem. first latch hold-to-transparent, 2nd latch transparent-to-hold: Both C relay coils change state. Sometime later, there is a break in the contact, and the internal Q and the outer Q both become the "not connected" state. Sometime after that, the 2nd latch Q contact makes contact, and Q becomes the held state. Hopefully the time between the break and the make is short enough that the short glitch at the 2nd Q relay coil isn't enough for it to change state. Compares every byte on 2 MMC/SD cards and confirms that they are identical. Perhaps gives some sort of display to indicate which byte is different. runs a compiler executable (from one SD/MMC card? ), with the source code to some ancestor compiler (on another SD/MMC card? ), and store the resulting executable (to a third SD/MMC card?). generate the ancestor compiler plus the boot code and everything else required to start a working environment (targeted to the fast computer). plug the ancestor SD/MMC card into a fast computer, and boot off that card. Use that trustworthy environment to more rapidly executed the later stages of the DDC process, and to inspect source code. So does this necessarily mean the relay computer needs to be able to run a C compiler? (perhaps TCC or the bootstrap for GCC)? Or is it possible for it to run, say, a Forth compiler? (I suspect that would require less RAM on the relay machine). That seems to require that a bootstrap C compiler be written with its source code in Forth. (Either that Forth source is compiled on the relay machine, or that Forth source is compiled on the fast computer). 3 x 8-bit accumulator registers, 2 x 12-bit registers (for index, addresses and jumps) plus a 12 bit program counter and 12 bit stack register. DAV: I think it would be interesting to re-arrange the 3 x 8-bit register bits to make 2 x 12-bit registers, so "everything" is 12 bits. 2008-12-15:DAV: Yet another idea for a relay computer: wacky mix of relays and 74x ICs. use relays to guide the bits in the correct direction -- in particular, the output of one shift register to the input of the "deeper" register when doing a "push"; the output of one register to the input of a shallower register when doing a "pop". Use a random mix of relays and 74x 4:1 muxes to implement more complex logic. one big *chunk* as IR is latched and relay configuration is set up. then 8 (or perhaps 12 or 16 or 24 or 48) quiet (or quieter) pulses as bits are shuffled out of some registers and into other registers. Hopefully building it as a "serial computer" will make it smaller. cryptographic applications -- because I can *see* it work, it's far more difficult for malware or keyloggers. What sorts of operations do we need to support to be able to do AES reasonably efficiently? Touch the magic. Gain a deeper understanding of how computers work. Compactness. Physically small and simple. Unlike Bill, I'm not so interested in the "density" of each opcode individually (Huffman-like compression). I'm even more interested in the "density" of the instruction set as a whole (LZ77-like compression), so I insist on extremely low overhead for subroutines. TTL and transistors and relays rather than FPGA. FPGAs do sound fun, but I want a system where I can touch and see and hear everything it is doing, rather than a mysterious black box -- I want (literally) every bit visible. Perhaps FPGA for the next one. 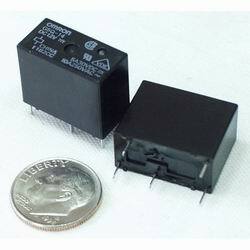 Jon Stanley suggests saving money by getting relays using eBay. I am surprised that reed relays cost more than PCB relays, since it seems that reed relays have fewer parts and so would cost less. 2008-08-10:DAV: what about "latching relays" ? Wouldn't that implement a register array in fewer relays than non-latching relays? Does it make sense to build Mueller C-elements for asynchronous computing out of latching relays? wire spring relay http://en.wikipedia.org/wiki/Wire_spring_relay claims that "Reed relays are better suited to data storage." reed relay http://en.wikipedia.org/wiki/Reed_relay claims that "reed relays can switch much faster than relays with armatures"
2008-09-06:DAV: I discover "Relay Computer Two" by Jon Stanley http://www.electronixandmore.com/project/relaycomputertwo/index.html a relay computer built from 281 relays ... That is far fewer relays than I thought were needed. Registers: All registers are "transparent". ("master/slave" would require twice as many registers). it's difficult to lookup A = B[C], because there are are no indexed loads. it's difficult to lookup A[B] = C, because there are no indexed stores. Those 2 things can be done if we "cheat" and write self-modifying code ... which this architecture makes fairly easy to do. Subroutine calls look unncessarily difficult. use lots of diodes -- perhaps LEDs. If every input to a block of logic goes through a diode, then it's impossible for that block to "backdrive" current through that diode. Since relays pull ~40 mA, pick LEDs that can handle 40 mA ... or pair up cheaper 20 mA LEDs. Since some (typical?) LEDs can block max 5V reverse, (a) use 5V relays and also (b) make sure we put flyback diodes (the same kind of LED is fine) on every coil. Say we go even futher and try to build "diode-relay logic" -- would that save a significant number of relays? DAV: diode-relay logic could be something like this: every block of logic has a SPDT or 4PDT relay near the output. The "common" of the switch connected to +24V. The other 2 lines (the NO and the NC terminals) of the switch are the 2 outputs, the signal and its negation. Many functions can be built using just that one SPDT relay and a bunch of input diodes ORed together to the coil, where each diode is connected to some signal, or to the negation of that signal -- that gives us OR and NOR outputs, and arbitrary inverts on each input -- so it can implement AND and NAND also. 2 layers of such logic give any possible Boolean function on the inputs. For example, 3-in XOR requires 5 SPDT relays. Is there a better way to build "diode-relay logic"? Probably, since all possible 3-input logic gates (including 3-in XOR) can be built using only 3 relays and no diodes: Each input connects to its respective coil (the other end of the coils connect to ground), so there is no backdriving problem. The first relay is 4PDT. Its 8 inputs (NC and NO terminals) arbitrarily connected to either nothing or +24V in order to select which particular 3-input logic gate we are implementing today. The second relay is 2PDT. The 2 common outputs of the 2PDT relay feed into the 2 inputs (NC and NO) of the third (final) SPDT relay. The common output of the final SPDT relay is the output signal. (Alas, it only generates the signal, and not also its complement). (yeah, a lot of words; a schematic would be better). Consider: eliminating the 16 bit MAR register, and adding 8 bits to the A, B, and C registers (for a net addition of 8 bits). Then you have a "pure" 16 bit machine (more or less). Make "load" always use the C as the address register, while "store" always uses A as the address register. Because *before* we do a calculation, C is usually free (it will be overwritten by the result of the calculation) -- but *after* we do the calculation, C holds the result we usually want to store, and so we can save 1 instruction in the program by using something other than C for the temporary address register. I'm hoping that losing MAB will be compensated for by making indexed addressing easier -- in particular, pointer dereferencing and array dereferencing and simple memory copies. (Such addressing uses load and store, but suppresses the load of C and instead uses the address already in C). [consider building] DAV: as warm-up for building a relay computer, consider building a relay clock. Perhaps use the 60 Hz line frequency as input. Does toggling the relay at 60 Hz wear it out too quickly? ... Perhaps, an LCR + relay oscillator running at 1 or 2 Hz would last much longer ... perhaps with a bit of input from the 60 Hz line frequency to phase-lock it. ... If we have a ring oscillator of relays, with (say) 12 relays tuned to give (say) 5 Hz for the rest of the clock -- with a small amount of 60 Hz line frequency to phase-lock -- does that merely postpone wearout by a factor of 12? global optimizations: given a single global clock signal, what is the maximum number of states that a set of n relays can step through before repeating a state? Can that be used to generate a state counter or program counter that uses fewer relays than the "classic" designs? (This is similar to the "busy beaver" problem). What if we (a) store all bits in ICs (say, a MMC card, a Ramtron FRAM, and a bunch of shift registers), but (b) did everything else (ALU ops, IR latch control signal decoding, etc.) with relays? Well, clearly we must have some sort of IC-to-relay and some sort of relay-to-IC interface. Relay-to-IC is pretty simple: either use 5 V supplies for both, or else use a resistor divider / diode clipping to convert 12 V or 24 V relay output to 5V or 3.3 V IC input. The tricky bit is relay bounce, and that is irrelevant for everything except the clock input. Perhaps somehow use 2 wire clock (which is immune to relay bounce) and somehow convert to a clean 1 wire clock for the ICs. IC-to-relay is a bit trickier. Traditional approach is to use a transistor per IC output. What about, in particular, the $2.41 TPIC6595 8-Bit Shift Register? It has one special output: SER OUT seems to be rated at only 0.020 A (but both source and drain), and restricted to slightly beyond 0 to 5.0 V. So a minimum resistance of R=V/I = 5 V / 0.020 A = 250 Ohms. Eight Power DMOS Transistor Outputs of 0.25 A Continuous Current -- at 24 V, that implies an output load of a minimum of R=V/I = 24 V / 0.25 A = 96 Ohms (minimum) -- so plenty powerful enough to drive a 480 Ohm 24 V coil. (I think the inductance of the coil is irrelevant to this IC, as long as the coil has a proper flyback diode). 1.5 A Pulsed Current Per Output (for up to 1 ms at 10% duty cycle) (open drain -- this constrains me to using "open" and "GND" to represent 1 and 0 or 0 and 1. ); when "open", it tolerates drain-source voltage up to 45 V (so apparently it could directly drive 24 V relays ... if the other side of the coil is connected to +24 V). One special power input: Logic supply voltage: must be about 5.0 V.
5 signal inputs: 0.85 Vcc or above for 1, 0.15 Vcc or below for 0. Put 1 LED at each coil for easier visibility? keep the index in some other memory other than the main memory. [relay computer] "How to pick a relay" http://www.leachintl2.com/english/english2/vol6/properties/how4.htm "There is no relay contact that can be used for switching all load levels. Each load level requires tailoring of the contacts for that specific application. Contacts rated as capable of handling "dry circuit to 2A" loads will do so. They cannot, however, handle loads that go from 2A to dry circuit levels. Knowing this might have prevented one misapplication that luckily had only embarrassing consequences." [build a relay computer] While using SPNO relays (single-pole, single-throw, normally open relays) may be the smallest and cheapest way to store register bits ... SPNO relays are not "universal". Perhaps it would be interesting to use DPDT or 4PDT registers to store register bits. (a) Using a single kind of relay for everything requires using a universal relay. (b) Using a relay with more than 1 pole gives me a *separate* input and output for a register, so I can directly hook the output to a data bus without worrying about "backfeeding" signals flipping bits in the register. Wikibooks: Microprocessor Design/Wire Wrap lists some relay computers. Wikipedia: Category: Electro-mechanical computers lists some notable relay computers. This page was last modified on 28 July 2015, at 06:59.